Latest News | Cantat Associates Inc. Since September 2017 in the state of Oman have started to make repair works of asphalt coverings with use of Cold Asphalt made on the Canadian technology and a concentrate "Perma - Patch"
Canat Associates Inc. and McAsphalt Industries Ltd have been in cooperation for over a decade, and for the first time a new technology of color asphalt has been developed. With this technology it is possible to apply colored cold asphalt in all-weather conditions for decorative applications and repairs suitable for all road surfaces. The asphalt is readily available to be sold in department stores and retail outlets countrywide. This news was announced at a press conference in LZC by Astana’s deputy mayor Kosman Aytmuhametov. From February to March in 2015, in the town of Tavrovo in the Belgorod region, a total of 100 square meters of pothole repairs were made possible by using cold asphalt developed by the Canadian Perma Patch technology. Cold Asphalt Perma Patch was paved In Tbilisi, Georgia. In Georgia, at the office of the governing party, "Georgian Dream," Tbilisi, in November 2015, paved "Cold asphalt McAsphalt Perma Patch manufactured by Canadian technology ". The work was carried out by the company «GeoNovation Holding» who is representing Cantat Associates Inc. in Georgia. On December 2nd, 2014, the president of Cantat Associates Inc. Alexander Zevin, together with the company manager Danny Golnik, introduced to the participants of the conference the technologies offered by the company, namely the production technologies of cold and warm mix asphalt, joint and crack sealants, emulsion materials, de-icers, as well as new developments in the production equipment of these materials. On November 18-19, 2014, Cantat Associates Inc. presented to a combined delegation from Russia and Kazakhstan the technologies and equipment, offered by our company, used in the construction of asphalt and concrete road pavements, developed by our partners - McAsphalt Industries Limited and Miller Group. On November 18, the delegation learned about quality control methods, used in the company's research and development centre, and visited its plant for production of emulsion materials (anionic and cationic), modified bitumen, joint and crack sealants and concentrates for cold and warm mix asphalt production. On November 19, the delegation visited a production site of road concrete structures, concrete pavements and foundations, learned about mobile concrete plants and their control systems. The delegation also visited Highway 7, where warm mix asphalt was used as a main paving material, along with the concrete barriers and decorative structures produced at the plant. Finally, the delegation visited the newly constructed section of Highway 404, which uses concrete pavement and foundation. In October 2014, our representative company in Belgorod, Russian Federation, LLC "Belgeosynt", launched its own production of Cold Patch based on Canadian technology and using the Perma Patch concentrate. Feedback from LLC "Rostra Group" (city of Almati), on the use of Perma-Patch cold patch for pothole repairs in the capital city of Astana. A total of 1500 tons of cold patch was produced. The feedback is available in the Documents section. Our representative in the Russian Federation, LLC SPE "PromSpecMash" (city of Ryazan), sent us feedback on the use of the Evotherm 3G (M1 subclass) additive in the production of sulfur asphalt mixes. Our company LLC SPE «PromSpecMash», has been using the Evotherm M1-3G additive, supplied to us by your company, for the last 3 years. Our company specializes in the production of sulfur asphalt mixes of all types. The use of this additive allowed us to significantly increase the temperature range from the mix production to the compaction stage. The minimum compaction temperatures have been lowered from 140°C to 50°C, without affecting the quality of the pavement. 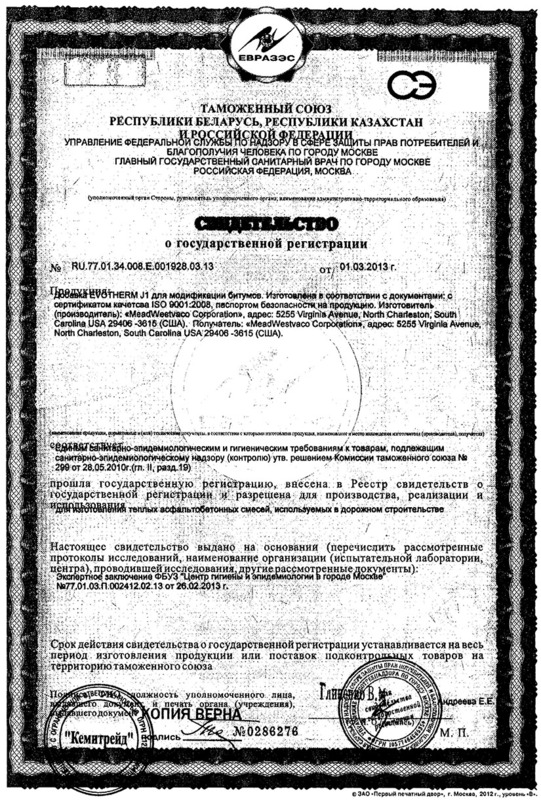 Our representative in the Russian Federation, LLC SPE "PromSpecMash" (city of Ryazan), obtained a State Registration Certificate for the Evotherm 3G additive for the production of Warm Mix Asphalt. This certificate attests, that the EVOTHERM 3G bitumen-modifying additive complies with the consolidated sanitary-epidemiological and hygienic requirements applicable to products, that are subject to sanitation and epidemic control, that is passed State registration, has been added to the State Registration Certificates Register and is approved for use in production, distribution and utilization in the production of warm asphalt mixes, used in road construction. The product is manufactured based on the following documents: ISO 9001:2008 Certificate of Quality, Material Safety Data Sheet (MSDS). McAsphalt Industries Limited and Cantat Associates Inc. conducted field testing of a mastic, produced based on a mix of a Beram-series joint and crack sealant and aggregate screenings at a 50:50 ratio. The resulting mastic can be used in the sealing of bridge expansion joints, where width varies from 500 to 700 mm. Our plastic bags for cold patch have been shipped to "Trinity Bay Paving" in Clarenville, Newfoundland. The bags, designed to hold 50 LB / 22.67 kg of cold patch, were especially developed at the customer's request with a reinforced carrying handle. These new bottom-filled bags allow manufacturers, distributors and consumers to handle bags with ease and convenience. "The Perma-Patch cold mix asphalt technology allows us to repair the designated road section within 20 minutes. This week, the city's officials conducted field testing of the material." Perma Patch cold mix asphalt placed around a manhole, in the city of Vladimir, Russian Federation, by our representative LLC "VMK". Cold mix asphalt, produced using the Perma Patch concentrate and technology, was used in the centre of Toronto, Canada, to cover communication channels. Our representative in the city of Krasnodar, in the southern region of the Russian Federation, LLC "Modern Asphalt Technologies", began production of cold mix asphalt, using the Canadian Perma Patch technology and concentrate, with packaging into Canadian-made polyethylene bags. A feedback letter (in Russian) can be found in the Documents section. Cantat Associates Inc. is now offering equipment for Cold Mix Asphalt packaging into polyethylene bags. Depending on the machine operator's work rate, the production capacity of the bagging machine can go up to 120 bags (30 kg) per hour (4 to 6 m3). The cold mix asphalt bagging machine is designed to package finished cold mix asphalt product into polyethylene bags. The machine hopper is loaded using a front loader. The hopper is equipped with a screw conveyor, used both as a feeder and agitator for the consolidated asphalt mix. In a uniform flow, the screw conveyor feeds the asphalt mix through a diverter valve into 2 chutes, for alternate discharge into bags. The production capacity is controlled via a variable frequency drive, which regulates the rotation speed of the screw conveyor. A weighing platform is located at the discharge station to monitor the batch weight. Lower and upper weight limits are set via the control panel. A slow discharge rate is automatically engaged for product top-up. Once the desired weight has been reached, the feed stops. The operator switches the diverter valve to the other chute and fills the next bag. Feed is switched on or off via pushbutton controllers, installed in both operators’ stations. Once filled, the bag is moved to the roller table-mounted heat sealing facility. WRT Equipment Ltd. was founded in 1968 in Saskatoon, Saskatchewan and by 1978, the company developed a product line and began providing solutions to the road building industry. Today, WRT Equipment Ltd. is a manufacturer of high quality products and components for the aggregate, asphalt and mining industries. WRT is committed to developing working relationships with customers, providing solutions to help their business succeed and reach production goals. WRT’s focus on providing solutions and quality-built equipment providing a long service life, blended with excellent service, is WRTs foundation for success. Initial startup of the WRT plant with configurations and supervised installation, takes no more than 2-3 days, with additional training of on-site personnel. The plants uses a design based on individual modules, allowing retrofitting the plant with additional (optional) components, when needed. For example, WRT’s cold mix plant, with production capacity of 7-30 TPH, can be retrofitted with additional modules, allowing it to produce also warm and hot asphalt mixes, with increased capacity of 45 TPH. Fuel consumption is one of the lowest, thanks to the continuous production flow technology (6.43 liters per 1 ton of hot/warm asphalt mix, 1.0 liter per ton of cold asphalt mix), since both heating and mixing virtually occur all at once – the material mixing zone is located in the 3rd portion of the drum mixer. Consequently, the heat, dispersed in the drum mixer does not release into the atmosphere and continues to heat the mix. The fuel consumption of batch plants, in comparison, is within the range of 11 – 13 liters per 1 ton of asphalt mix, which surpasses the fuel consumption of WRT plants by 71 – 102 %. Energy consumption in these plants is also among the lowest. For example, the energy consumption of WRT’s 60 TPH plant – is only 150 kW/hr. Batch plants from other manufacturers stay within the range of 230 - 260 kW/hr, which surpasses the energy consumption of WRT plants by 53 -73%. Reliability: The plant contains a minimal quantity of high-wear components, which dramatically decreases the costs of purchasing replacement parts and allows full-scale plant operation during the peak season, without having to halt production for repairs and/or part replacement. The Drum-Mix technology: Thanks to its unique drum-mixer/heater, the material mixing time is 40 seconds, as opposed to batch-type plants where the mixing time is only 25 seconds. This enables the production of SMA while maintaining the same production capacity. The plant is fitted with an innovative, accurate weigh batching system, allowing batching of aggregate materials with accuracy of ± 1.0%, bitumen ± 0.5% and mineral filler ± 2-3% while maintaining continuous asphalt mix discharge. An additional advantage is that mixing takes place within an inert environment without access to oxygen, which eliminates bitumen oxidation. Feedback from the municipal organization of the city of Belgorod, responsible for the road maintenance operations in the city, following the completion of vast pothole repair operations across the city, using the Perma Patch cold patch. The feedback (Russian) can be found in the Documents section. Our representative in the Southern regions of the Russian Federation, LLC «Modern Asphalt Technologies», performed pothole patching repair works in the city of Krasnodar with the use of cold mix asphalt, produced using the Perma Patch technology and concentrate. Polyethylene bags for packaging finished cold mix asphalt product, in a total of 112,300 pcs., were shipped to our distributor in Tolyatti, Russia, LLC "NovTecAs". Cantat Associates Inc. offers polyethylene bags with welded bottom, without side folds, with diagonally oriented fibers that provide film reinforcement (attributing increased strength to the polyethylene film). The bags are produced according to customer requirements and can be used in a wide range of applications, including cold mix asphalt packaging. Inner layer - black color, outer layer - white color. Print on both sides of the bag, with anti-scratch surface. Perma Patch concentrate for cold mix asphalt production, was shipped to our representative in the southern region of the Russian Federation, LLC "Modern Asphalt Technologies", city of Krasnodar. Report on field testing performed using the Perma Patch cold mix asphalt as a pothole repair material in the Belgorod region in Russia. The report (in Russian) is available in the Documents section. At the request of our partner company LLC «NovTecAs», testing of the Evotherm 3G additive was performed by a certified laboratory in the city of Tolyatti (Russian Federation). Laboratory report with comparative testing of pothole patching cold mixes, produced using Azol 8030 (Russia) and Perma-Patch concentrate (Canada). The comparative analysis was performed by an accredited laboratory, in accordance with the "RosDorStroyCertification" system and the requirements of GOST standard R ISO/MEK 17025-2006. Cold mix asphalt, produced by LLC "NovTecAs" of the city of Tolyatti, Russian Federation, using the Canadian Perma Patch technology, was placed at -27°C. Perma Patch concentrate for cold mix asphalt production, a total of 40 drums, was shipped to our representative in Tolyatti, Russian Federation, LLC "New Asphalt Technologies - NovTecAs". In the period between December 2 and 4, a delegation from the Russian Federation visited Canada and took part in the International Construction and Infrastructure Conference, organized by CERBA. A presentation of technologies, introduced in Russia by Cantat Associates Inc, was delivered by the company president Alexander Zevin. The delegation also visited the McAsphalt Industries Limited research centre in Toronto and the emulsion and modified bitumen plant in Oshawa, as well as the LNT Solutions plant for production of de-icing products for airports and roads. Our representative in the Samara region in Russia, LLC "NovTecAs New Asphalt Technologies" received and fulfilled an order to supply more, than 3000 tons of cold mix asphalt packaged in 1000 kg big bags, for the purpose of reservoir waterproofing in crude oil loading terminals, in the Far North region. We received feedback for the implementation of McAsphalt Perma Patch Cold Patch by our representative in the Samara region of Russia, LLC "NovTecAs New Asphalt Technologies" (city of Tol'yatti, Samara region), who produced 3000 tons of Perma Patch cold mix asphalt for LLC "Velesstroy" (one of the largest companies in Russia in realization of the most complicated objects of the oil, gas and energy supply industry), for the purpose of reservoir waterproofing in crude oil loading terminals, in the Far North region. The document (available in Russian), can be found in the Documents section. On September 16, a meeting was held with the Commercial Director of State Enterprise "Municipal Construction Administration" of the Moscow City Administration, Vladimir Mironov, and his colleagues, where a presentation was delivered by the president of Cantat Associates Inc, Alexander Zevin, on the production of cold and warm asphalt mixes on mobile asphalt plants from American company ADM (a representative of ADM, Keith Hults, took part at the meeting and answered questions from Mr. Mironov), as well as the production of emulsions and modified bitumen, based on the technology of Canadian company McAsphalt Industries Limited. The representatives of SE "Municipal Construction Administration" of the Moscow City Administration expressed their interest in the implementation of the proposed technologies in the city of Moscow and the Moscow region. Warm-mix asphalt placed in Yellowstone National Park helped build U.S. government support for the energy-saving technology, which also contributes to smoother pavement. When considering how cars and trucks generate such a large part of the world's greenhouse gas pollution, it's easy to overlook what lies beneath them. But under all that traffic, there are roads. And the paving material itself-the asphalt, concrete, and rock-and how it is placed, have an important impact on the atmosphere. Energy goes into the construction of every highway and byway, whether it's made of asphalt, concrete, or even gravel; whether it's a narrow ribbon winding around mountains, an endless flat stretch across the prairie, or a congested freeway. Moreover, the way that roads are built and maintained has a significant impact on how much energy is burned by the vehicles that roll-or crawl-on the surface. As governments weigh spending money to restore or expand existing roadways in the developed world and to construct entirely new ones in the developing world, they are asking questions about sustainability that were never considered in the early years of infrastructure build-out. The answers are not easy. With public investment about $190 billion per year on highway, street, and bridge construction in the United States and Europe, researchers are working to develop a way for policymakers to make road construction choices that take into account the energy in every step of the pavement's long lifecycle. And the asphalt and concrete industries are introducing new technologies and mustering evidence on old ones, all to demonstrate their commitment to making paving greener. Cantat Associates Inc. (Canada), ADM (USA) and LLC "Stroimontazh-2002" (Republic of Sakha, Yakutia) conducted start-up and commissioning works of the ADM SPL-Series mobile asphalt plant, with production capacity of 110 tons per hour, for production of Cold Mix Asphalt using the Perma Patch concentrate, Warm Mix Asphalt using the Evotherm concentrate and traditional hot mix asphalt with improved quality indicators. Our representative in the Samara region in the Russian Federation, LLC "New Asphalt Technologies NovTecAs", sent us this video of their packaging process of cold mix asphalt, produced with the Canadian Perma Patch technology and concentrate. The cold asphalt mix is packaged into 30 kg plastic bags and sold in retail. Test runs of "Highway 7" in the north part of Toronto (Richmond Hill, Markham), where companies McAsphalt and Miller Group used Warm Mix Asphalt as a primary pavement surface materials. The Roads Committee of the Ministry of Transportation and Communication of the Republic of Kazakhstan, has issued an Order for the implementation of the “Perma Patch Cold Patch” technology, throughout the territory of the Republic of Kazakhstan. The document has been published in the "Documents" section. Gen3 liquid and IceCare solid (granular) de-icers for runways, Magic Ice Stop for railways, produced by Canadian company "LNT Solutions". The company, based on innovative developments, manufactures de-icing and anti-icing products, widely used by the aviation and railway industries, and packages these products for distribution in retail. The company products include liquid de-icer "GEN3" and granular de-icer "Ice Care" for airport runways, taxiways and aprons, liquid de-icer "Magic Ice Stop", used by the railway industry to prevent the formation of ice on switches, coupling and the 3rd rail, providing an alternative to rock salt without the mess, damage or corrosion associated with the use of traditional de-icing materials, which cause an irreversible damage to the environment. We received a purchase request from the company LLC «Complex Safety Systems» for cold mix asphalt, in order to patch a pavement section which sunk after placing an overpass at ulitsa 40 let Pobedy, city of Tolyatti. We inspected this section and calculated the required quantity of cold mix asphalt to be used. Following the preparation work on July 16, we placed 1 ton of cold asphalt mix over an area of 12.5 m2. Traffic flow resumed immediately following the completion of work. The customer remained satisfied. Additional photos and video can be found on the website of LLC "NovTecAs"
Beram 3060 LM Joint and Crack Sealant, designated for use on road pavements and airport runways, in the quantity of 23000 kg was shipped to Russia. The sealant is supplied in 50 lb boxes (22.67 kg), stacked on 20 pallets in standard 40' containers. Our partner company LLC "Dortechnologiya Plus", has manufactured and shipped equipment for production of liquid blends, using the Perma Patch and Evotherm concentrates, used in the preparation of cold mix, warm mix and traditional hot mix asphalt with enhanced performance, on a portable ADM SPL 110 asphalt plant, with production capacity of up to 110 tons per hour. On June 25/26, a portable SPL-series plant produced by ADM (Asphalt Drum Mixers Inc.) of Indiana, USA, with production capacity of 110 tons per hour, was shipped to the Republic of Sakha (Yakutia) in Russia. Cantat Associates Inc. presents a complete technology of production of cold mix asphalt using locally selected ingredients (aggregate, bitumen, diesel), allowing producers to minimize raw material costs and maximize their profits. The mix design, prepared at our research centre in Toronto, Canada, will present manufacturers a complete formula for producing cold mix asphalt using their local ingredients, with only a small addition of the Perma Patch concentrate, based on the following (sample) formula. 1000 kg (100%) of final cold mix asphalt (cold patch) product, modified by the Perma-Patch concentrate, consists of 950 kg (95%) aggregate material of fraction 5-10 mm and 50 kg (5%) liquid binder (LB). The exact formula for production of cold patch, is determined based on the quality of the aggregate material, at the McAsphalt Industries Limited Research Centre in Canada. for use in the production of warm asphalt mixes with lowered production and compaction temperatures. The report is available in the "Documents" section. Our partner in the Republic of Buryatia, Russian Federation, LLC "DorStroyService", began production and placement of cold mix asphalt (cold patch), produced according to the Canadian technology with the use of Perma-Patch concentrate. This technology has been successfully introduced and implemented under the direct supervision of the chief engineer of LLC "DorStroyService" and our representative in the republic, Igor Baksheev, who received training and certification in Canada in June 2012. On March 28, 2013, our partner in the Russian Federation, LLC "Teplodor", completed the certification of warm mix asphalt, produced using the Evotherm additive, supplied by Cantat Associates Inc. The certificate is available in the "Documents" section. Cantat Associates Inc. has become the exclusive representative of Asphalt Drum Mixers (ADM), USA, in the CIS republics, Baltic republics and countries in Eastern Europe. ADM is the largest developer and manufacturer of parallel (continuous) and counterflow asphalt plants in the world. Since 1974, ADM has provided asphalt producers with the highest quality plants and components in the industry. The high quality equipment and components, produced by ADM, are recognized as the best in the field. For over 40 years, ADM has been assisting and accompanying its clients in every step of the way - from plant design, permitting assistance and installation, to the lifetime backing of its legendary service and parts group. For minimized downtime, ADM asphalt plants are designed with many industry-standard components available virtually anywhere. With the training and qualification, provided by ADM, nearly all maintenance can be performed by on-site personnel. It is a true customer commitment that stands behind more than 1200 ADM asphalt plants worldwide. With this latest milestone, Cantat Associates Inc. is now offering our representatives a complete package of technologies, products and equipment, allowing them to launch fully independent production of cold, warm and hot asphalt mixes. We are pleased to announce the addition of the newly designed Stepp OJK-185 DAC kettle to our fleet of joint and crack sealing kettles for road and airport construction and maintenance. The Stepp OJK-185 DAC offers an all new design and list of features that puts us ahead of our competitors, Crafco and Cimline, including an increased kettle capacity (185 gallons/700 liters), dual loading chutes, lower profile (allowing even easier access to the tank), new engine enclosure to accommodate air compressor. - Oil Jacketed tank now includes the front and rear head for better and faster heat transfer to the product. This Monday, the first unit of the OJK-185 DAC was shipped to Russia along with 28000 lbs of our Beram 3060 LM crack sealant. Lots of excitement was in the air after 5 months of hard work to engineer a complete new kettle with the highest quality components, that will find widespread use in Russia and CIS, USA, Canada, as well as other regions of the world. We invite you to take a look at a video of the OJK-185 DAC above, as well as photos of the shipment below. At present, lead time is 4 months once an order is placed. Mixed loads are available for kettle + joint and crack sealant, shipped in a 40' standard container. The presentation topic was - innovations in road construction for the North and the Arctic. - Alexander Zevin, President, Cantat Associates Inc.
- Alexander Nechaev, General Director, "SevZapdorStroi" Ltd.
Evotherm 3G Warm Mix Asphalt was placed in a 24-km section of the M-55 (Baikal) highway Irkutsk-Chita, Buryatia, Russia. A total of 3100 tons of warm mix asphalt, produced using the Evotherm 3G technology and concentrate, was placed under environment temperature of -19°C, with a haul distance of 42-44 km. The feedback letter in both original Russian and English translation is available in the "Documents" section. Evotherm 3G Warm Mix Asphalt was placed on the streets of the city of Nizhneudinsk (Irkutsk oblast), Russia. A total of 1020 tons of warm mix asphalt, produced using the Evotherm 3G technology and concentrate, was placed on the streets of Nizhneudinsk, with environment temperatures ranging from 0 to -3°C. Bemalastic 1213 BDM is a hot applied, flexible, polymer-modified asphalt waterproofing membrane. Bemalastic 1213 BDM forms a seamless continuous monolithic waterproofing membrane which is impermeable to moisture penetration and remains flexible over a wide range of temperatures. Bemalastic 1213 BDM is designed to protect structures from costly damage caused by water infiltration. Waterproofing concrete slab construction on highway bridgedecks, parking garages, roof terraces, plaza decks, pedestrian concourses and podiums. Single course construction such as tunnels, reservoirs, planters, foundation walls and reflective pools utilizing two course construction. Protected, inverted membrane roofing systems. Bemalastic 1213 has been shipped to our representative in Ukraine, Digyunsa, along with 40 drums of Perma Patch concentrate for production of cold mix asphalt. Following successful negotiations with Minnesota-based company Stepp Manufacturing Inc., Cantat Associates Inc. has obtained exclusive rights for the marketing and distribution of oil-jacketed crack-sealing kettles, for use in joint and crack sealing operations in concrete and asphalt pavements. Additional options and modification options allow a fully customizable unit, based on the customer's needs and requirements. This partnership allows us to introduce a product, which presents a better alternative to other similar products from Crafco and Cimline, thanks to its higher reliability, customizability of features and options and high level of competitiveness. Representatives of the state-owned company "Russian Highways" ("Avtodor"), visited Canada between June 18-24, and were introduced to the mobile asphalt mixing plant for production of cold, warm and hot asphalt mixes, as well as to the production of cationic and anionic bitumen emulsion materials, production of modified bitumen and production of joint and crack sealing materials. In addition, our representative in the Republic of Buryatia, Igor A. Baksheev, who had also been introduced to the said technologies, has completed training and received certification at the McAsphalt research centre in Toronto on the methods of Quality Control of Perma Patch cold mix asphalt and Evotherm 3G warm mix asphalt production. An initial quantity of 113 kg (250 lb) of Beram 3060 LM joint and crack sealant has been shipped to Doha, Qatar, and will be used in the construction project of the New Doha International Airport (NDIA), executed by MIDMAC Contracting Company W.L.L. During its visit in Canada (April 16-22, 2012), the Presidential delegation of the Sakha Republic (Yakutia), led by President Borisov E.A., company Cantat Associates Inc. together with McAsphalt Industries Limited received full support for the introduction and implementation of new advanced technologies in road construction and repair in the Sakha Republic (Yakutia). A series of agreements were concluded, including an agreement between LLC "Dorogi Hangalass" and Cantat Associates Inc. on the introduction of innovative technologies, structures and products. The delegation will depart on Saturday, April 14, 2012, to conclude agreements with several Canadian companies on behalf of the Republic of Sakha (Yakutia) Ministry of Transportation. The Presidential delegation for the business trip will include the First Deputy of the Minister of Transportation and Roads, Alexander Tarasov. It is expected, that during his visit to the province of Quebec, he will visit the Bombardier aviation plant, where an agreement is scheduled to be concluded between the plant and JSC "Aviakompaniya Yakutia", to enable cooperation in the area of air transport development. In addition, a meeting is scheduled to take place with representatives of Cantat Associates Inc. to conclude an agreement between LLC "Dorogi Hangalass" and Cantat Associates Inc. on cooperation in the area of the introduction of innovative technologies, structures and products. The business meetings will continue as the Yakutia Ministry of Transportation will deliver a presentation on the passenger terminal of the "Yakutsk" airport, as an alternative airport for transcontinental cross-polar aerial routes. The Perma-Patch cold mix asphalt technology and concentrate was used in pothole repairs of the first 1 KM section of the highway Nartkala-Kakhun-Pravourvanskiy. The cold asphalt mix showed excellent results and ease of compaction. The environment temperature during the operations was -15°С. Deputy Chair of the "RCC OPITNOE" certifying agency Mitrokhin V.S. and Deputy General Director of Innovation and Research of JSC "LENAEROPROJECT" Vtorushin V.N., directors of company "Koronker", Tretyak T.M. and Khomiakov M.E., conducted a production analysis and evaluation of the quality assurance of "Beram 3060 LM" joint and crack sealant for airports, roads/highways, bridges in the manufacturing facilities of McAsphalt Industries LTD (Canada). Following this certification, the Beram 3060 LM joint and crack sealant, manufactured in Canada, can be used for joint and crack sealing in airports, roads/highways, bridges in the territory of the Russian Federation. "Evotherm 3G" produced excellent results when used in sulphur-containing asphalt mixes, and will be used in general maintenance operations in "Gazprom" projects (Astrakhan, Novy Urengoy). In addition, crack sealant Beram 3060 LM is planned for use in crack sealing operations in April, in objects belonging to "Gazprom" and "Voronezh Avtodor". The McAsphalt Perma Patch cold mix asphalt was used in the Kabardino-Balkarian Republic for the first time, during road pavement repair operations by our representative in the region, LLC "Uzhnaya Nerudnaya Kompaniya". The Perma Patch modified cold asphalt mix was used in a pothole repair project on a road section in the Gomel region. Weather conditions during operations: Environment temperature -2°С; relative humidity 90 %; North-Western wind of 12 m/s, occasional flurries. Warm Mix Asphalt with Evotherm 3G additive was used in the construction of a new local road in the capital of Tatarstan, Kazan. A total of 100 gr of Evotherm 3G additive was used to produce 1 ton of warm mix asphalt (WMA). A total of 4000 tons of WMA were produced. Total haul distance - 95 km (2-3 hrs). Environment temperatures at the time of paving - from +4°C to -4°C. Pavement samples showed excellent compaction (k=1.0), water saturation (w=5.0) and average density (γ=2.42). A section of a federal highway in the city of Orenburg, Russia, was paved using Warm Mix Asphalt with Evotherm 3G additive. Total section length - 500 m, 2 lanes. Pavement thickness - 7 cm. Operations took place under cold weather temperatures of (-7) – (-10) °C with a strong crosswind and periodic snowdrifts, and lasted a total of 2 days. Compaction temperature measured at 90 °C. The Republic delegation, led by First Deputy Prime Minister of the Sakha Republic (Yakutia), A. Struchkov, arrived in Toronto to take part in the international Construct Canada 2011 conference and hold negotiations with several Canadian companies. On November 28, the delegation visited the headquarters of Canadian company McAsphalt Industries Limited in the province of Ontario, which specializes in the production, application, research and development of innovative road construction and maintenance products. The meeting was led by the McAsphalt Marketing Manager, Mike McLean, and the president of Cantat Associates, exclusive leader of McAsphalt products in Russia and the former Soviet Union Republics, Alexander Zevin. In a presentation on road construction technologies, developed and employed by McAsphalt, Alexander Zevin presented technological solutions for road construction and repair. The "Cold Mix Asphalt" technology is used for pothole repair in any time of year and under any weather conditions, which guarantees the high quality of repair works and prolonged life cycle of the pavement. This technology passed the engineering-technical expertise in 2005, with the participation of Canadian experts together with the Yakutia Public Institution on Roads Exploitation. The results of this expertise were followed by positive assessment of the feasibility of this technology's application in the republic. A major advantage of the "Warm Mix Asphalt" technology, which was approved for utilization in road construction projects in the Sakha Republic (Yakutia), is the ability to extend the road construction season. When laying hot mix asphalt on a cold surface, the mix temperatures drop quickly, which prevents proper asphalt compaction based on the GOST standard requirements. Due to the poor compaction, potholes and cracks start to appear in the newly paved road immediately the following year. The "Warm Mix Asphalt" technology allows to extend the asphalt compaction interval and significantly improves the quality and life cycle of the pavement. As part of the visit, the Sakha Republic (Yakutia) delegation visited the McAsphalt plant for production of emulsified bitumen products, as well as joint and crack sealants, used in a wide range of repairs of concrete and asphalt surfaces under cold weather conditions. The delegation expressed their intention to build a similar emulsion plant in the republic. The sides emphasized the significance of the utilization of these technologies during road construction and maintenance works in the Sakha Republic (Yakutia) and expressed their intentions to continue their cooperation in this field. The GFRP Composite bridge deck construction technology has been presented to a delegation from the RF. A series of road construction technologies (cold mix and warm mix asphalt, joint and crack sealants, emulsified bitumen products production plant, GFRP composite bridges, etc.) has been presented to a delegation from Yakutia, Russian Federation, led by the First Deputy Prime Minister of the Sakha Republic (Yakutia), Struchkov Alexey Alexandrovich. The presentation took place at the McAsphalt headquarters in Scarborough, Ontario and was followed by a tour of the Research Centre and the Oshawa plant for production of emulsified bitumen products. Certificate of conformity to Ukrainian "DSTU" standard has been issued for the Beram 3060 LM joint and crack sealant, for sealing of airstrips, roads and bridges, product of Canadian company McAsphalt Industries Limited. Also issued was a conclusion report on the application of Beram 3060 LM in the construction and maintenance of roads, bridges and airstrips. The documents can be viewed in the "Documents" section. Certificate of conformity to Russian "GOST" standard has been issued for the Beram 3060 LM joint and crack sealant, for sealing of airstrips, roads and bridges, product of Canadian company McAsphalt Industries Limited. The certificate can be viewed in the "Documents" section. On October 6, a delegation from the Russian Federation (Moscow and Moscow region, Murmansk, Smolensk, Oryol, Bryansk) visited the all-weather cold mix asphalt production facility in Belarus, belonging to "GomelOblDorStroy" in the city of Gomel (see photos). Our representative "LLC Koronker", has successfully completed the application and testing of Beram 3060 LM in the first section of the expressway. A video of the joint sealing process is available here. Negotiations were held with the Federal Highway Administration of the Volga-Vyatka region, together with Cantat Associates Inc. representative in the Republic of Tatarstan, Shigapov Marat Rustamovich. Ottawa, Canada. First Deputy Chairman of the Government of Sakha Republic (Yakutia) Gennady Alexeev took part in a meeting of the Russian-Canadian Intergovernmental Economic Committee workgroup for the Arctic and the North. The Russian delegation was headed by the Deputy Minister of Regional Development of the Russian Federation, Alexander Viktorov. The delegation also included representatives of the Russian Federation, executive bodies, business, science and NGOs. The purpose of the meeting was preparation for the 8th session of IEC, which will involve questions relating to the cooperation in the fields of transportation, housing, development of resources in the Arctic, trade and tourism. During the meeting, Gennady Alexeev informed members of the workgroup of the prospects of a joint Russian-Canadian cooperation in the territory of the Sakha Republic (Yakutia) in the fields of road construction, preservation and restoration of biodiversity in the Arctic, development of telemedicine, production of pharmaceuticals, bioactive food supplements and cosmetics produced from environmentally friendly materials. The appearance was followed by a positive response and high interest during the workgroup meeting, as well as in the subsequent private meetings with representatives from the Canadian side. And so, the president of Canadian company "Cantat Associates Inc", Alexander Zevin, offered to boost cooperation with the Sakha Republic (Yakutia) government by implementating "Cold Mix Asphalt" and "Warm Mix Asphalt" in the construction and maintenance process of roads, as well as the construction of an emulsion plant, allowing a complete production cycle of asphalt mixes sufficient not only to meet the needs of the Republic, but also the needs of the surrounding regions. Particularities of the construction of infrastructure objects (including bridges and tunnels), under conditions of permafrost, were discussed with Tim Stevens, Project Manager of the largest Canadian engineering company SNC-Lavalin. International conference, dedicated to the cooperation opportunities between Ukraine and Canadian companies in the field of road construction and maintenance too place in Kiev, as reported by Ukrinform. The event had been organized as part of the preparation of Ukraine for the hosting of EURO-2012, by the Ukrainian National Committee of the International Chamber of Commerce (UNC ICC) in collaboration with fuel and energy company "UKPROMENERGO" and LLC "Digyunsa" - the official representative of companies McAsphalt Industries Ltd, Aluma Systems, Cantat Associates Inc in the former Soviet republics. At the conference, presentations were given by the Canadian companies, who are world leaders in the introduction and implementation of prospective and advanced technologies. These companies specialize in the production of materials and equipment for construction of roads and bridges. McAsphalt Industries Ltd, Road Maintenance Equipment, Aluma Systems and Universal Building Technologies Inc expressed their interest in investing into Ukraine. According to the president of UNC ICC, Vladimir Shelkunov, the conference the conference opened a series of presentations by world-known international partners, in the following professional areas: road and bridge construction, latest technologies in the construction of housing, offices, hotels etc. "Detailed presentations by Ukrainian and Canadian experts and specialists will be held in the next 1.5-2 years and involve the presentation of Ukraine as a nation, open for cooperation with international partners not only as part of the preparation for the hosting of EURO-2012, but also in the area of attracting investments and economic development" - said the president of UNC ICC. Ukraine already possesses positive cooperation experience with Canadian companies, including, in the area of construction of housing for military personnel, and is ready to explore new directions as part of the cooperation, noted V. Shelkunov. He added, that the use of asphalt and equipment from Canadian manufacturers is cost-effective. In addition, the offered asphalt products are of high quality. In turn, the Road Services representative of the Autonomous Republic of Crimea, Sergey Andreev, stressed the high quality of "Cold Asphalt" from Canadian suppliers, which is now being tested in Ukraine. According to him, "Cold Asphalt" will find a widespread use in our country. The Ukrainian specialist was also interested in the asphalt recycling machines (Reclaimers). The conference was attended by representatives of the Ukraine Ministers Cabinet; committee for construction, urban development and housing of the Verkhovna Rada of Ukraine; national agency for preparation for EURO-2012; a number of government departments and ministries: Ministry of Regional Development and Construction, Ministry of Transportation and Communication, UNC ICC, Ministry of Defence, City of Kiev State Administration, as well as directors of district road and regional highway services departments of Ukraine.